This rendering shows the potential view from New Salem Highway looking into the future additions at Weston View. H. Michael Hindman Architects PC and SEC Inc. designed the development plans. 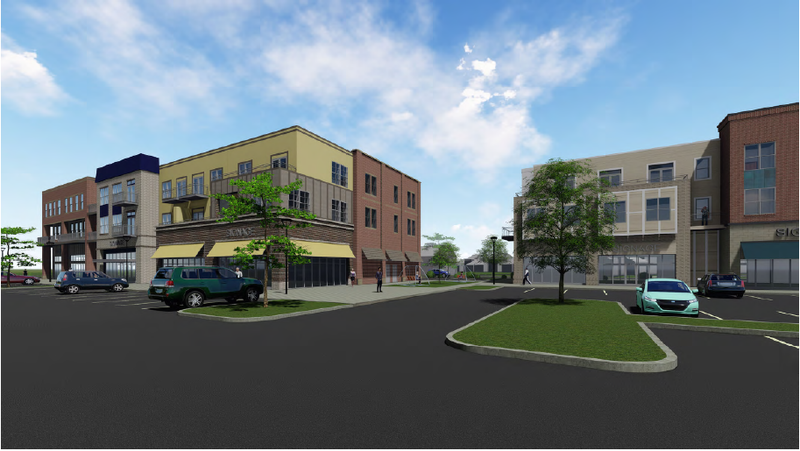 The Murfreesboro City Council on April 4 approved major design changes to mixed-use development Weston Village. The property is on New Salem Highway at Armstrong Valley Road. Developers Bob Patel and Mike Chaudary asked to change the existing Planned Unit Development zoning classification to increase the number of residential units while cutting the space devoted to commercial use in the multi-floor buildings. The old plan called for 56,200 square feet of commercial space and 24 one-bedroom condos, in three one-story buildings and two three-story buildings. Now, they have been approved for 30,800 square feet of commercial uses and 85 condos in four three-story buildings. Seven residents from surrounding properties spoke at a public hearing to share their concerns, which ranged from the multi-story buildings towering over their existing townhomes to traffic being impacted. One resident, Mark Barstow, said the Weston Park neighborhood would welcome a mixed-use development that matched the existing architectural style — which this new plan does not. In other business, a Barfield-area subdivision which was denied by the Murfreesboro City Council in March came back before the council on April 4 and received approval. The council on March 21 rejected the annexation and zoning for The Cottages at Snell Cove, located on Veterans Parkway near Barfield Road. The plan calls for 45 houses and two commercial buildings. Neighbors who live around the development, largely from Martha’s Haven subdivision, fought the project at the Murfreesboro Planning Commission and the March 21 council meeting. Many expressed concerns over plans to connect the development to Kristi Charline Street, which dead-ends in a “stub” about 30 feet to the east of the site, inside Martha’s Haven. They say the connection would allow traffic to cut through their neighborhood between Barfield and Veterans. The April 4 meeting was not considered a public hearing, so only one resident of Martha’s Haven was able to speak after Councilmember Bill Shacklett made a motion to allow it. Councilmembers debated the merits of allowing development without the connection to Kristi Charline, which would provide a secondary entrance/exit to the new property. City policy calls for connecting to stubs whenever possible. Another stub connection would be available from a different side of the development, but the impacted landowner, who lives there, has not allowed it. That landowner is the person selling the property to the developers of The Cottages at Snell Cove, according to the city council. Shacklett commended the developers, but said he believed the development plan presented to the council was not a good one. Councilmember Eddie Smotherman, who serves on the Murfreesboro Planning Commission, said the development plans went through strict review with the city. The council approved the development plans on a 4-0-3 vote. There were three abstentions: Shacklett, Vice Mayor Madelyn Scales Harris and Rick LaLance.